The AD8224 is the first single-supply, JFET input Instrumentation Amplifier available in the space-saving 16-lead, 4 mm 4 mm LFCSP. It requires the same board area as a typical single Instrumentation Amplifier yet doubles the channel density and offers a lower cost per channel without compromising performance. Designed to meet the needs of high performance, portable instrumentation, the AD8224 has a minimum common-mode rejection ratio (CMRR) of 86 dB at dc and a minimum CMRR of 80 dB at 10 kHz for G = 1. Maximum input bias current is 10 pA and typically remains below 300 pA over the entire industrial temperature range. Despite the JFET inputs, the AD8224 typically has a noise corner of only 10 Hz. With the proliferation of Mixed-Signal processing, the number of power supplies required in each system has grown. Designed to alleviate this problem, the AD8224 CAN operate on a 18 V dual supply, as well as on a single +5 V supply. The devices Rail-to-Rail output stage maximizes dynamic range on the low voltage supplies common in portable applications. Its ability to run on a single 5 V supply eliminates the need for higher voltage, dual supplies. 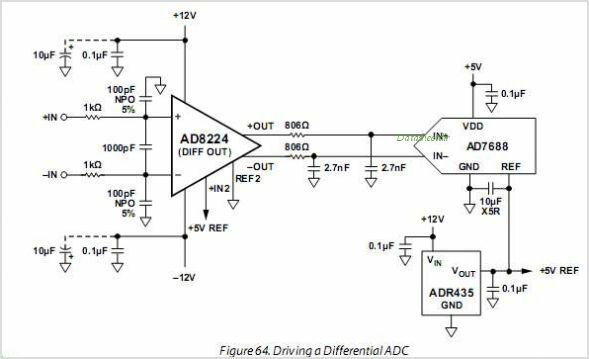 The AD8224 draws 750 A of quiescent current per Amplifier making it ideal for battery powered devices. For a single-channel version, use the AD8220. This is one package pinout of AD8224,If you need more pinouts please download AD8224's pdf datasheet. 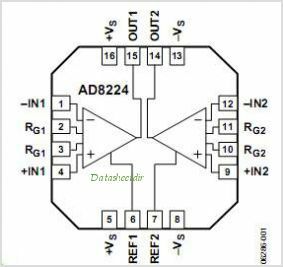 This is one application circuit of AD8224,If you need more circuits,please download AD8224's pdf datasheet.